Bishop is in the danger room running the scenario in which his two fiends died. No matter how many times he tries it always plays out the same, they die. Prof-X, Storm and Forge watch from the observation booth psyche analyzing their newest time lost x-man. They end the scenario and Storm invites Bishop to a night on the town with her, he accepts after some prodding. He gives Forge a holographic Projector to fix which contains his sister. Elsewhere Bantam the partner of Trevor Fitzroy is fleeing for his life. Montjoy a criminal from the future considers him a loose end and plans to kill him. They are interrupted by a street gang which Mountjoy kills and commandeers one of their bodies after Bantam flees. Bantam calls Xavier’s looking for Bishop only for Jubilee to tell him where Bishop and Storm are. He finds Storm and Bishop right as mountjoy finds him. 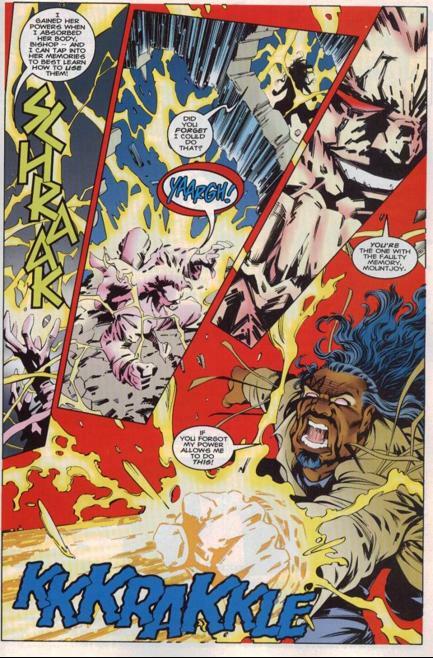 While Bantam explains the situation storm is taken over by the villain and he uses storm to battle Bishop. During the fight he gets roughed up and he injures Bishop with arrows. Mountjoy flees storms body when he realizes Bishop would kill her if it meant taking him down. 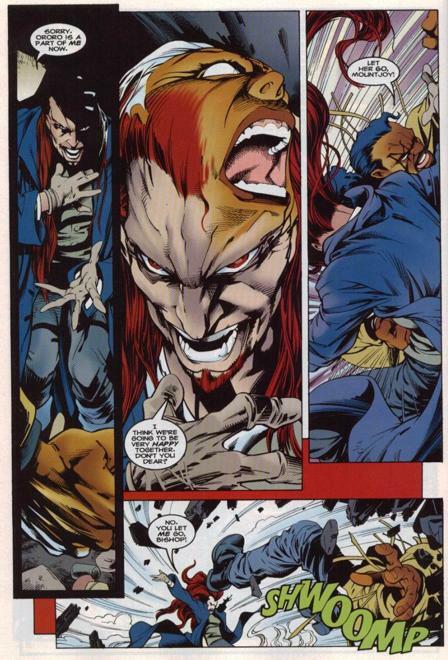 Storm saves Bishop from having his throat slit as Mountjoy flees. I really enjoyed the art compliments of Carlos Pacheco (one of my all time favorites J ). Bishop comes across thanks to the art as a hard nosed tough guy cop who’s willing to do just about anything to grab his man (criminal). It was also interesting to hear Bishop muse over whether he could in fact alter the timeline to change his future or if there was some “higher” purpose for him being in the past. That is an interesting Philosophical debate right there for reasons I shall not get into. Bishop also comes across as cold thanks to the future in which he grew up in a reservation camp and was branded for being born different. Unlike the x-men who have experienced hatred perhaps only Magneto has had a similar experience in what “hate and fear” can really lead to. This characterization is essential to all bishop thinks and does for the next sixteen years. 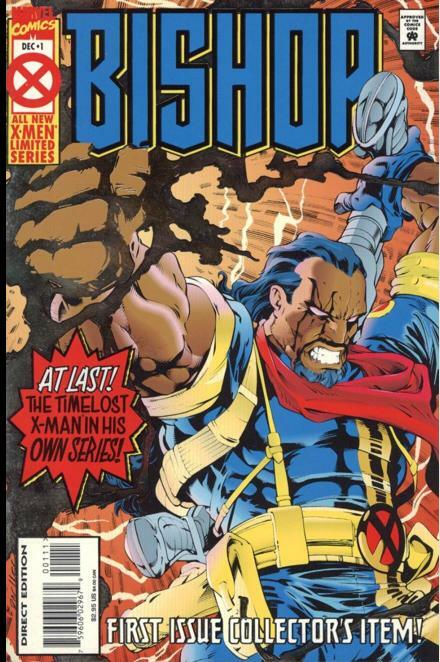 Bishop has played by the X-men’s rules occasionally but he’s always been his own tortured man having lived through things few of his peers can ever truly relate to. It was also nice to hear him speak of his dead sister shard however briefly. This is also an issue that could have lead to a very different kind of relationship with Storm since she’s helping him get used to a simpler time and integrate him into modern 20th century society. Storm again shows her motherly leadership in inviting Bishop to the movies this is something I’m not sure Xavier of Cyclops would have done. Mountjoy is presented as a sadistic and skilled villain out to kill just about everyone and enjoy every moment. It’s an interesting contrast the joy, fear and glee his feels while doing these wicked deeds while Bishop the “good” guy is a stoic block of nothing (emotion wise). Bishop is not a very engaging lead character especially if you don’t like him already this wont be the place that you do so. He’s essentially a 2d character right now and the major fleshing out comes years after.